Who will get the new pension? 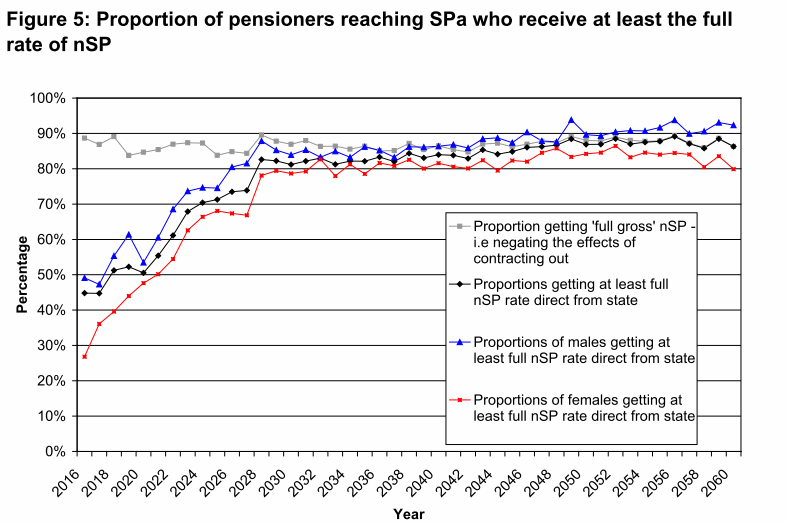 I’m indebted to Gareth Morgan for drawing my attention to a discrepancy in the figures for the new pensions scheme. Gareth had drawn information from the Sunday Times, which had discovered from an FoI request that “Two-thirds of the people who reach state pension age in 2016-17 will not receive the full pension, according to the DWP.” The Sunday Times had been told: “For most people who retire next year, the weekly pension will fall short of the headline figure by an average of between £35 and £55 a week … For those who retire in 2020, the average shortfall will be between £15 and £25. I was referring to different information from the DWP, which suggests that 45% of people will get the full rate (I’ve shown the graph here: the numbers are on page 35). These figures can’t all be right. Part of the explanation may be, I think, the apparent disappearance of large numbers of women from the figures in the second report (see figure 24, page 37) – and I’m not at all clear how as few as 20,000 women come to be counted as 27% of all those retiring. I suspect that the Sunday Times’s figures are more trustworthy than the DWP’s. Further note, 6th April: I’ve had an explanation from the DWP. The totals they presented were rounded to the nearest 10,000, while the percentages were left alone. That explains how 20,000 gets to be treated as 27% of 90,000. The huge approximation – on a figure of 20,000, plus or minus 5,000 is 25% in each direction – means, unfortunately, that the figures in the report don’t add up. The main surprise is that official statistics can be presented with such little regard for the data. Today’s Autumn Statement reverses the decision to withdraw large amounts of people’s Tax Credits, but otherwise it doesn’t have much to say about benefits. Most of the decisions relate to changes in timing. Apart from that, there’s a plan to make social renting subject to the same Local Housing Allowance rules as private rented housing and rules to stop some claimants spending more than a month abroad. The effects of cuts or spending decisions generally appear in the tables of a Blue Book, on pp 112-3. It’s surprising that two apparently minor tweaks to the ‘Savings Credit’, a complex addition to the means-tested Pension Credit, are set to save £135m next year. The Savings Credit currently costs £618m, and goes to 1.15m pensioners (an average of £536); the projected saving is more than 20%. One of the two tweaks is a small adjustment in the rates: Paragraph 3.49 states: ” The Savings Credit threshold will rise to £133.82 for a single pensioner and to £212.97 for a couple (note: this year’s rates are £126.50 and £201.80), which will reduce the single rate of the Savings Credit maximum by £1.75 to £13.07 and the couple rate by £2.68 to £14.75. ” The other tweak, in para 1.135, is this: “by adjusting the Savings Credit threshold, the Pension Credit awards for those currently receiving Savings Credit will be frozen where income is unchanged.” If this means that people receiving Savings Credit will lose the value of the £4.40 increase in the minimum guarantee, it will affect about 723,000 claimants (the ones who get both the Guarantee Credit and the Savings Credit). That could add up to the size of cut the Treasury is talking about – but this money is not actually being saved, it’s just not being spent on some while it is being spent on others. The Scotsman devotes this morning’s first two pages to concerns about private pensions after independence, under the title Scottish independence: EU deals pensions blow. It’s prompted by an announcement from the EU that the rules on cross-border pensions will stay as they are. Under EU rules, cross-border pension schemes have to be fully funded; many UK schemes (about 5000 out of 6300) are currently in deficit. A scheme doesn’t become a cross-border scheme because it’s paid to someone abroad – many people live abroad now (for example, pensioners living in Ireland and Spain) and receive British pensions. It’s a cross-border scheme if it is based and operated across boundaries, levying contributions from people in different countries. There are some issues. Some pensions firms will have to change the way they operate. Schemes in deficit will have either to stop taking contributions from people situated abroad, or set up new, independent schemes for each country. 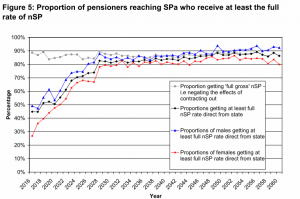 Some people will have to join new pensions schemes, as many people do now when they move jobs; and some of them will find, reflecting the current economic climate, that the terms are less favourable than their current scheme – typically the scheme will offer lower returns, it won’t be salary-related, and and the date of retirement will be later. It’s a consideration, but it’s hardly decisive for the independence debate. “The single-tier pension would be paid in full to everyone who reaches State Pension Age after the introduction date and has 35 qualifying years of National Insurance (NI) Contributions or NI credits. There would be a qualifying requirement of 7-10 years of contributions. It looks as though Scottish Government is thinking of a clean break: a country’s responsibility to pay pensions will be based on a person’s address at the time of independence. Anyone currently in receipt of a State Pension will be passported to the new system. If you worked in Scotland but now live in England, you won’t get a Scottish pension. Conversely, if you worked in England but moved to Scotland, you will. That should mean that there is no such thing, on the first day, as an English or Scottish expatriate; anyone who moves over the Border after retirement will carry with them entitlements from the nation they are coming from, regardless of where the contributions were paid. The position of people who have not reached retirement age is not so cleanly defined. It’s supposed to be dealt with by a transitional arrangement. There are some other issues to resolve. The policy documents refers to people ‘living and working’ in Scotland. If someone lives in Scotland but has only worked in England, what happens? A person who works for more than 10 years in both countries would meet the qualifying requirement in both. If the total is over 45 years, there is an entitlement to a full pension and enough further contributions to qualify for a partial second pension. Someone who worked in two other European countries might reasonably expect pensions from both. Would two pensions be payable? 1.2 million State Pensions are paid to Britons living overseas. Which ones will be paid by Scotland? Once payments to expatriates are accepted, can the government legally avoid making payments to expatriates in England? None of these issues is a fundamental objection to the development of an independent Scottish system – they are examples only of the little knots that can trip governments up. Partly in reaction to the scaremongering about independence and devolution, however, there has sometimes been a contrary tendency to pretend that there are no genuine problems to resolve. In this case, there are. A recent report by the Institute for Fiscal Studies has received a lot of press attention, and it has some helpful facts and figures, but it actually does very little towards breaking new ground. It says that benefits in Scotland cost relatively more than England for some groups (notably, for people with disabilities), and relatively less for others. It says that most of the money goes on pensions, which is hardly news. And it says that if there is radical reform, there will be losers as well as gainers, and that it is only possible to mitigate the losses by spending more. So far, so obvious. The remit of the IFS briefing note is limited; it’s concerned with expenditure rather than equity or methods of paying benefit. It doesn’t actually provide key data on the issue which most people want to know, which is what Scotland could afford. To work that out, it would be necessary to compare Scotland’s national income and government revenue on one hand with liabilities and expenditure on the other – we have a good idea of how much money is spent, but how much revenue there would be is another issue entirely. Without that, it’s not really possible to say anything about the affordability of benefits. There are no indications that Scotland’s liabilities exceed its income to such an extent that benefit payments would be impossible; but beyond that, it’s difficult to draw any firm conclusion. What a country can afford depends on what it’s willing to pay for. There are more serious challenges to developing a devolved or independent benefit system, but they are as much about mechanism as about cost. One example which emerged earlier this week was the question of what happens to occupational pension schemes: a cross national scheme has to be funded, so any Scottish schemes would need to be separated out. That points to a general issue about such schemes, which is that the smaller the scheme is, the more difficult it can be to balance the contributory base with existing liabilities. The basic way to overcome that problem is through pooling of risks between pension schemes – which generally happens in France (it’s referred to as a form of ‘solidarity’), but not in the UK, and its absence is a major reason for the instability of current UK schemes. A larger problem is the question of what happens to the contributory National Insurance system when all the records are currently held in Newcastle. I’m doubtful that the system is susceptible to devolution. It’s hard to see on what basis records could be transferred; Scotland would need a new and different pensions scheme, like a Citizens Pension. There are, too, problems of cost control generated by a range of benefits which pay people to buy specific services in the market – housing, social care and child care among them. This approach is inherently defective; in every case it has led to accelerating costs without providing adequate basic protection. Any government, whether it is for Scotland or the UK, would need to rethink.